The development of 001 Game Creator has its roots as far back as March 2000 when two friends, Mike Weir and Pierre Cayer, set out to create a meagre 2D shooter called “Secret Agent 009” using Click n’ Create. The game was left incomplete but provided the inspiration for “Codename 001”, the predecessor to Engine001. The two started working on Codename 001 in 2001, with Mike taking on the role of programmer and Pierre filling the role of artist. Designed in Visual Basic, the idea for this new project was to recreate Secret Agent 009 with major improvements but it soon became evident that they couldn’t truly being work on the game without first implementing some of the project’s key features. To that end, the two shifted focus away from the game itself in order to concentrate on the engine. There were no plans of ever releasing this engine to the public mind you; it was simply a means to an end. As the engine gradually improved, increasing amounts of new features were being suggested by those aware of the project. Various collaborators also pitched in to help move the project forward. Amongst them were two notable individuals; Brad Smith (who composed the first four pieces of music) and Dj Diablo (who provided valuable feedback and programming assistance). Before long, the decision was made to release Engine001 as a fully-fledged game creation engine with Codename 001 being reduced to a demo game that would showcase some of Engine001’s main features. A website was created in the hopes of garnering external support for the project but initial attempts proved rather disappointing, as the site’s inactive message boards quickly began to illustrate. 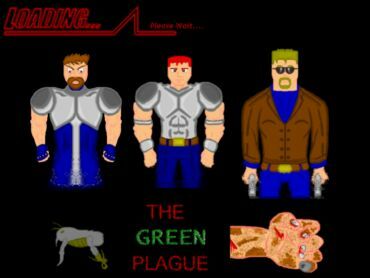 While still continuing work on Codename 001, the two also started developing a Role-Playing Game entitled “The Green Plague” (TGP) within RPG Maker 2000. Months were spent working on a single project until boredom set in, which promoted the two to switch over to the other previously ignored project. By early 2003 work on Codename 001, as well as Engine001, had largely stalled in favour of TGP. By the time the two had gotten around to working on Engine001 again, the decision was made to drop Codename 001 as Engine001’s flagship title in favour of TGP. Since Engine001 was undoubtedly going to need major RPG elements to support their new title, work on TGP was postponed in order to focus on getting Engine001 up to speed. …That is until May 2005 when their situation changed. By this point both Mike and Pierre had just finished their first year of University and, conscious of the four month period in-between full academic years, both set out to find something to do with their spare time. Terminating Engine001 stood out as a low point for the both of them. To that end, both agreed on reviving the project – only this time they’d do things differently! No longer would they let their ambitions overtake them! This would arguably become the most important point in Engine001’s history. The two agreed to cease work on TGP in order to make Engine001 their sole focus and a new official website was created (designed by Joel Steudler) with a new message board set up. Pierre revamped Engine001’s graphics, having improved since his previous endeavour, while Mike perfected Engine001’s existing interface and began developing a variety of new features. They then set out to garner public attention and generate anticipation for Engine001’s upcoming release. A new demo (Demo001) was released on the 5th August 2006, quickly followed by Map001 (the game editor) on the 30th August 2006. The two scoured the Internet for prominent game making forums in the hopes of promoting Demo001 and Map001. Ads were posted on a variety of forums, including Gaming World where Engine001 garnered a reasonable amount of attention. The official Engine001 website garnered 400 hits following their advertising efforts (the greatest number of visitors to date). As new features began being implemented and new versions of Map001 were released, hits surged to approximately 2,000 visitors per day. By July 2007 this had grown to more than 3,000 visitors per day. Furthermore, Engine001 had started to gain international attention – with forum members claiming to have discovered Map001 thanks to an Australian PC magazine.